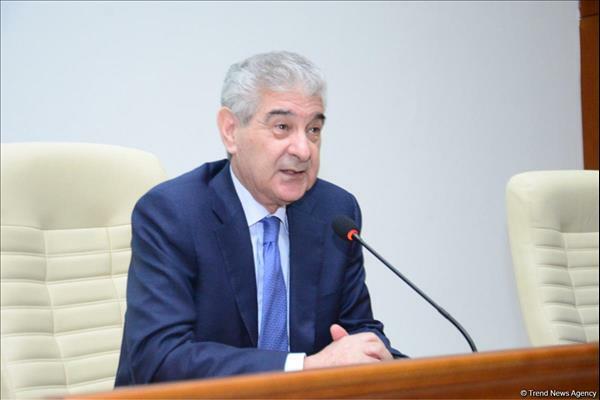 Azerbaijan will make efforts for young people to take part in the municipal election as candidates this year, Azerbaijani Deputy Prime Minister, Executive Secretary Deputy Chairman of the New Azerbaijan Party Ali Ahmadov said. Ahmadov made the remarks in a meeting with young people in Baku on Feb. 5. 'President of Azerbaijan, Chairman of the New Azerbaijan Party Ilham Aliyev held a big meeting on Feb. 1, in which young people also took part, he said. 'The president gave recommendations to young people and informed them that Azerbaijan pays special attention to the youth. 'The president pays great attention to the dialogue with young people, he said. 'In general, establishing a dialogue with the population is one of the main directions of policy in Azerbaijan. 'In this sense, the meeting with young people is of particular importance," Ahmadov added. He added that more than 700,000 members of the New Azerbaijan Party, that is, the overwhelming majority, are young people. 'The youth also made a significant contribution to the successful completion of election campaigns in Azerbaijan, Ahmadov said. 'All this testifies that young people support the ruling party's activity, he said. 'Young people must be also active in social and political life, as today's young citizens are future politicians and managers. Ahmadov also said the party, within its capabilities, creates conditions for young people to be able to demonstrate their activity. 'The next municipal election will be held in December 2019, he said. 'We will make efforts for active young people to be able to participate in the election as candidates. 'Thus, the youth will be able to actively participate in the country's public and political life, Ahmadov added.